Kensington 2.4 GHz Wireless Presenter, w/ USB Receiver, Model: 33373. The new L230 and L130 bring enhanced graphics performance (with improved color depth and widescreen support) and a microphone port―all in a stylish new smaller chassis (just 1 inch tall and 4.5 inches square) that takes absolutely no desktop space at all when mounted to the back of a monitor. We even include the mounting bracket at no charge. Share one host PC with up to 30 users. Dramatically reduces acquisition & support costs. Connects to host PC via Ethernet. Compact, reliable & energy-efficient (no moving parts). - Width: 115 mm / 4.5 inches, Depth: 115 mm / 4.5 inches, Height: 26 mm / 1 inches. - 100-250 VAC, 50-60 Hz. - 5 VDC, 2 A. - Nominal consumption: 5 Watts. - Power: connection to power supply. - LAN: connection to network. - Ready: connection to host PC. - 01 Â USB Flash Memory Port. - 02 - Microphone Input. - 03 - Speaker Output. - 04 Â Keyboard Port. - 05 Â Mouse Port. - 06 Â LAN port (RJ45). - 07 Â Video port. - 08 Â DC Power Input. - 09 Â On/Off Power Switch. - 640x480, 800x600, 1024x768 (at 60 or 75 Hz refresh rate), 1280x1024 (~63 Hz) and 1440x900 (60Hz). All feature up to 16-bit or 24-bit color support. - Stereo output via speaker port. 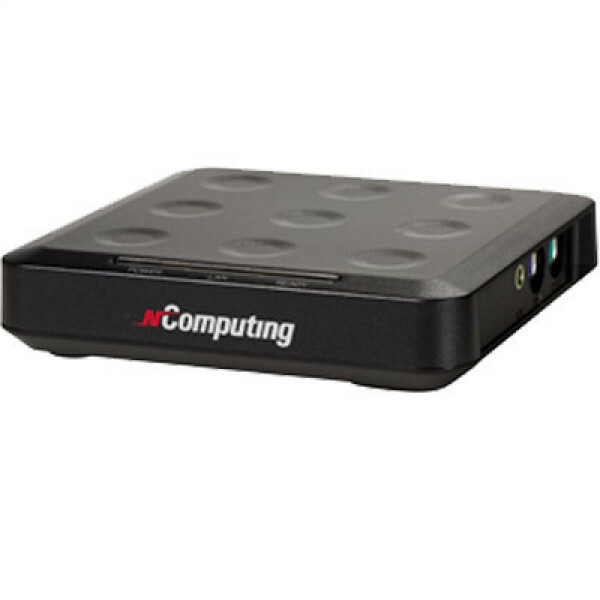 - Supports USB 1.1 memory devicesÂ requires Windows OS on host. - All solid-state design, no moving parts, no fans, no local user storage. - NComputing System-on-Chip with SDRAM and flash. - Embedded NComputing operating firmware (no local user OS). - >>100,000 hours (calculated using Bellcore Issue 6 TR-332, Case 2, Part I at 40°C). - No local user storage. - FCC Class B, CE, MIC, NOM, GOST R and RoHS compliant (China RoHS (50)). - 30 users* when using a server host OS (i.e. Windows Server 2003). - 10 users when using a desktop OS (i.e. Windows XP). - NAccess terminal services software with User eXtension Protocol (UXP). - Microsoft: Windows XP Professional and Media Center Edition 2005. - Windows Server 2003, Small Business Server 2003. - Linux: several variants (refer to support section of Website for latest supported revisions of Linux). Maintenance: Online remote update via NAccess Management Console (included). - See Recommended Host Configuration Guide at: http://www.ncomputing.com/ncomputing/support/download.php. - L230 Kit includes access terminal, power supply/cord, software installation & userÂs guide CD/license, Quick Install Guide, monitor mounting bracket and LAN cable. PC, monitor, PS/2 keyboard, PS/2 mouse, speakers and other peripherals are NOT included and must be purchased separately. - NControl (remote control and management), NShield (hard drive partition recovery).